If you’ve tasted the breads at Sullivan Street Bakery, I think you’d agree: Jim Lahey is a genius. And the best part is that he isn’t one of those crazy secret-keeping geniuses. In fact, I’d say he’s pretty much the opposite of secret: his no-knead bread making method is super well known and documented. In 2006, an article was published in the New York Times about the no-knead bread method and it took the bread baking world by storm. Usually no-kneading means no bread, but not with Lahey’s recipe. The not-so-secret? Time. Instead of using elbow grease, time does all the work for you. A tiny amount of yeast (compared to standard bread recipes) and a long fermentation creates a loaf with a crisp, crackly crust and large airy crumb. 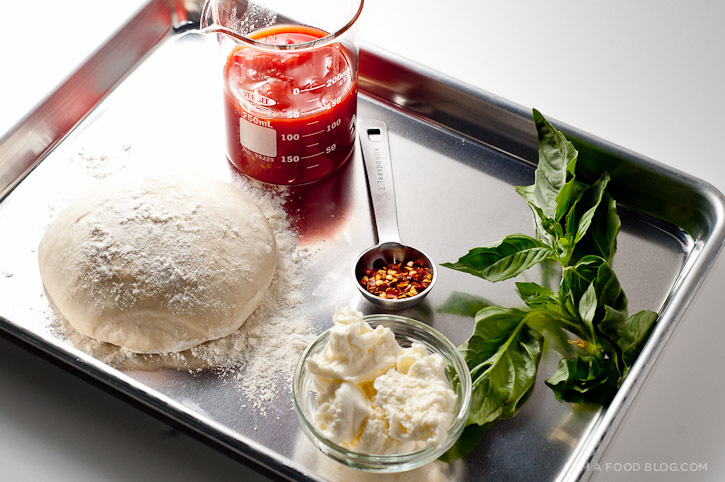 No-knead dough is perfect for making pizza. Lahey even has a restaurant devoted to pizza called Co. I visited Co a couple of years ago to see what the hype was about and it was everything they said it would be: crisp, yet chewy with a gorgeous char at the edges. Co has the kind of pizza you can only dream about making at home. I’ve made plenty of pizzas at home and they’ve always turned out disappointing. Soggy, unflavoured crusts, with no crispiness or charring. But no more! 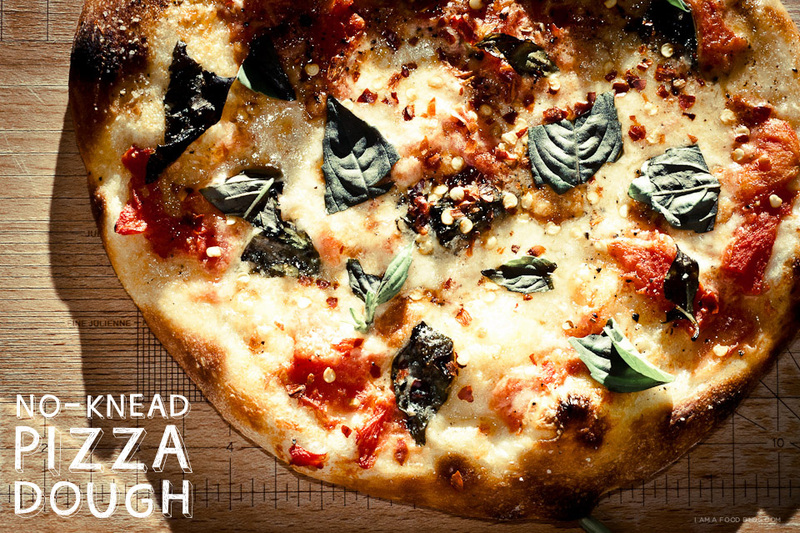 Lahey has a new pizza book coming out that will save us all from bad homemade pizza. 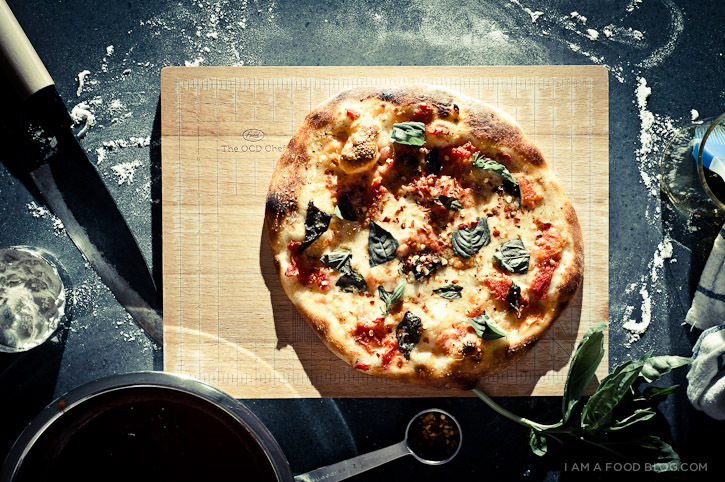 His super simple pizza dough recipe is featured in the March issue of Bon Appétit and it gives you amazing results. Feel free to make your pizzas with the toppings of your choice. 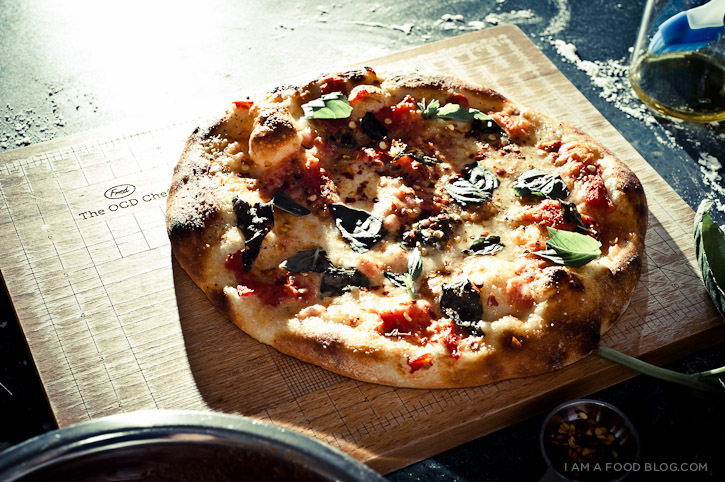 We kept it simple with crushed tomatoes, fresh mozzarella, basil and crushed red pepper flakes. It’s pretty awesome that these pizzas came out of my home oven: the crusts were chewy, bubbly and crisp. It sure beats flying to NYC when the craving hits! 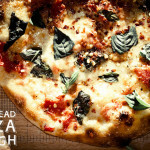 I am bubbly, I am crisp: I AM NO-KNEAD PIZZA! Whisk flour, salt, and yeast in a medium bowl. While stirring with a wooden spoon, gradually add 1.5 cups water; stir until well incorporated. Mix dough gently with your hands to bring it together and form into a rough ball. Transfer to a large clean bowl. Cover with plastic wrap and let dough rise at room temperature in a draft-free area until surface is covered with tiny bubbles and dough has more than doubled in size, about 18 hours. Transfer dough to a floured work surface. Gently shape into a rough rectangle. Divide into 4 equal portions. Working with 1 portion at a time, gather 4 corners to center to create 4 folds. Turn seam side down and mold gently into a ball. Dust dough with flour; set aside on work surface or a floured baking sheet. Repeat with remaining portions. If you don’t want to use the dough right away, wrap the balls up individually and keep in the fridge up to 3 days. Bring them back to room temperature by leaving out on the counter, covered, for 2 to 3 hours before needed. During the last hour of dough’s resting, prepare oven: arrange a rack in middle of oven and preheat to its hottest setting, 500°–550°. Working with 1 dough ball at a time, dust dough generously with flour and place on a floured work surface. Gently shape dough into a 10″ disk. Arrange dough disk on baking sheet; top with desired toppings. Bake pizza until bottom of crust is crisp and top is blistered, about 10-12 minutes. Transfer to a work surface to slice. Repeat with remaining pizzas. This looks delicious! What would be the proportions for only one pizza instead of 4? I’m not sure if you can scale the recipe down due to the small amount of yeast. However, the dough will last in the fridge for 3 days. Thank you for your answer Steph, I’ll try it soon then! I’m planning to try this dough, is it important to use active dry yeast or can I use simple baker’s yeast? Thanks! As far as I know, you can use baker’s yeast. Hi, I have a question for you. If I want to save the half dough for other day, can I put the dough in the fridge and do the fermented process 18 hours when I need to use it? Thanks!!! You can refrigerate the dough after the 18 hour fermentation process for up to 3 days. After reshaping the dough into balls, wrap each dough ball separately in plastic wrap and chill. Unwrap and let rest at room temperature for 2–3 hours before shaping. Actually, I made this recipe yesterday and got a big compliment from my husband. He said it is the best pizza I ever made for him and asked me if I had save any dough. That’s how I came out this question. Thank you for sharing this recipe. I enjoy reading your blog with all those yummy pictures and couldn’t wait to see your new coming recipe. If possible, would you be kindly sharing some korean recipes in the future. Thanks! I hear about people freezing pizza dough, would that work with this recipe? We had this dough for our pizza feast last night and everybody loved it. Such an easy recipe, and by far the best dough I’ve tried so far. I am also wondering about freezing it. I feel like freezing it would work easily as pretty much any pizza dough can be frozen, but maybe there is something about this process that would change that? I like to make pizza dough in big batches but am still trying to find the “perfect” recipe and this looks like one I really should try! I haven’t tried freezing the dough personally. Let me know if it works out for you! Hi hi, ok – can’t wait to try this. I’ve been expirementing at home for a while w/ the no-knead bread method (beer bread, sourdough bread, etc…much success… have just started working on the perfect pizza done on my bbq – the only appliance I can get a super hot temperature … this is the next dough I’m trying! Thanks! this looks great! how big do the pizzas come out like 10inch maybe? Hi! I’m wondering if I can use instant quick-rise yeast instead of active dry yeast for this? Would it affect the amount of time I should leave the dough to rise? Thanks for the tip on the dough. Been having Pizza Nights here at home since 2003 (Well, it has evolved already into steak and baby back ribs night as of late. Kneading the dough and making over 20 pizzas in one night was apparently too time consuming even for 5 people). Do you think the dough will rise similarly if I use whole wheat flour ? Jim Leahy’s book, My Bread, is amazing, I highly recommend it! Also, I was also wondering what the proportions should be if I wanted to make this with wheat flour? thanks for the wonderful recipe!!! just wanted to know if you mean warm water or just normal room temperature water? The water is just regular room temperature. hi! I made this last night and it was great. Only thing is that it didn’t brown as much. Could you give me any pointers in getting the crust to brown without leaving it in the oven for too long? Thanks for the recipe! Oh, and about the pictures, what camera and lighting setup do you use? They all look fantastic! Your recipes are really great. All the best to this blog. Once again a happy family, and my husband who has had pizza dough duty using Jamie Oliver’s recipe up till now just handed the future pizza evenings over to me! Is there a way to keep the extra balls of dough for future use? the refrigerated balls can be kept for up to three days. Another lovely recipe to try :) Question I have is how long would I need to do the first rise considering I live in a hot and humid country where the average temperature is 30 degrees Celsius. Would you be able to help with this? I don’t have any experience with proofing in a hot/humid country, but I imagine that it would proof quite a lot faster. Maybe aim for 10-12 hours. Oh my goodness! This looks unbelievably good. Definitely going to have to give it a go! Does this work with 00 flour? and if so would it be the same ratios? i haven’t tried with 00 flour, but it should definitely work with the same ratios! lahey doesn’t specify flour type, so let me know how it goes if you try it! Is 1/4 t. really enough yeast? I was wondering about adding Ale in place of the water, would it compromise the recipe too much ? 1/4 teaspoon works because it’s such a long rise. i haven’t tried with ale, so i’m not sure what it would do. maybe just replace a 1/4 cup to start with? let me know how it goes! Finally tried this dough. My husband was really skeptical. It was the best dough we have ever made! We used the baking stone and it turned out really crispy the way I like it. May I know how big is 1 cup of flour? What type of cup do you use? it’s a standard american dry measure cup, about 120 grams for flour. as for pizza size, 10-12 inches each. hope that helps. That looks delicious, but 18 hours is a long time to wait.